Present basic information about the complex human body without overwhelming students in grades 5 and up with medical jargon! Understanding the Human Body makes the study of the human body even more fascinating with Far Out Facts, fun tidbits of information that will keep students on their toes. 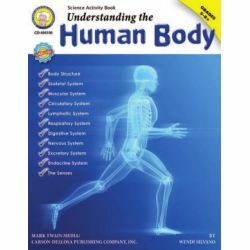 The 80-page science resource book includes a number of websites that provide students the opportunity to further explore various body systems or concepts identified in the activities. This book supports National Science Education Standards.